The search is on... for the BEST bathroom in Canada! 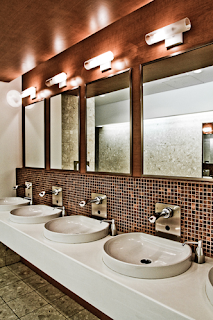 The search is on… for the BEST bathroom in Canada! Bathrooms. They’re probably the thing that we use the most– yet talk about the least. I mean, the cleanliness of a bathroom is a really important thing. I always dread when I’m in a restaurant or bar and go down the dank stairwell to a mystery bathroom. Will it have toilet paper? When’s the last time someone cleaned it? And then it’s either a sigh of relief when you enter, or you hold your breath and wait for it to be over. But now, those that have put the effort into maintaining their restrooms are getting the recognition they deserve. That’s right, bestrestroom.com is on the prowl for Canada’s best bathroom. And they’ve narrowed their search down to five finalists. Three of them are in Toronto and two are in Vancouver. The finalists in Toronto include Spice Route Asian Bistro & Bar, Mildred’s Temple Kitchen and the Metro Toronto Convention Centre. In Vancouver, they’ve got the Shangri-La Hotel and the Cactus Club Cafe. And you can vote! So go check it out and decide where you’d want to do your most private deed. After all, it’s a highly neglected part of our culture. And while its understandable, I think this a fantastic opportunity to draw some attention to bathrooms because while we may not love them, we need them. And I love a good bathroom.